I was once one of those fans who became a convert because of the US national team. Early on, I had wanted to play (American) football and score touchdowns, but my parents squashed that idea quickly, citing safety. After watch our team make a surprise run into the Round of 16 on home soil at the 1994 World Cup, I began playing soccer instead. I enjoyed playing, but especially enjoyed watching the game, particularly the World Cups. I can remember waking up late at night to watch the USA play in the 2002 Japan/Korea World Cup, and celebrating in a bar in DC in 2010 when Landon Donovan scored a last-minute goal to send the US to the Round of 16. Unfortunately our last two World Cup appearances had been cruelly ended at the hands of one team—Ghana. I arrived in the northeastern Brazilian city of Natal at 3AM on Monday—gameday. Team USA's opening match would be against none other than our rival Ghana. Because of the soccer history between the two countries, increased expectations of the USA this year, and the fact that this would be our pivotal opening match in the Group of Death, I believed that this was the most important game in US soccer history. 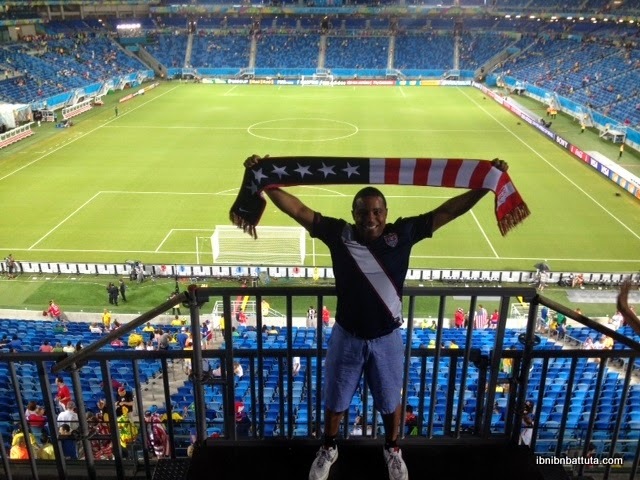 Gavin shows his US pride before the start of the match in Natal. Almost everyone in my pousada, or guesthouse, had also come for the USA v. Ghana match and were equally excited as me. The atmosphere was already buzzing when we sat down for breakfast. But when we headed out to watch the day's first match (Germany v. Portugal) we found out that all bars are closed on matchdays, and ended up grabbing McDonald's at an air-conditioned shopping center and watching the game in an electronics store. By mid-afternoon, several hours before the 7PM start time, we made our way toward the Natal stadium and found a convience-store-turned-bar to tailgate with the growing number of American fans. From around the US and the world, there was a true sea of red, white, and blue. 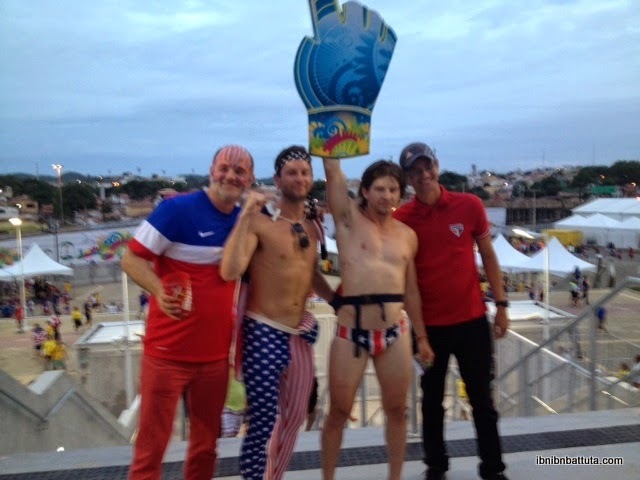 (Between 25,000 and 35,000 American fans were reportedly in Natal to cheer our boys to victory.) While most stuck to wearing USA jerseys or basic US color combinations, there were also some extroadinarily elaborate costumes: I saw Paul Revere, Uncle Sam, Abe Lincoln, and Captain America, among other interesting creations. Brazil constructed the Arena das Dunas specifically for the World Cup, locating it awkwardly between two parts of the city that, unlike the arena, were still under construction. 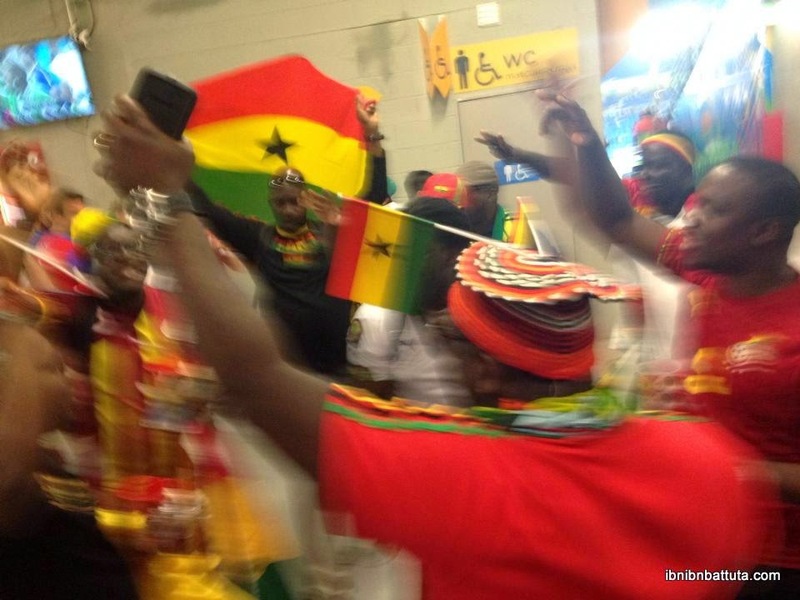 Nevertheless, the arena looked beautiful as supporters poured in, including the growing Ghanaian contingent, who were also in an exuberant mood as they sang and danced their way to the stadium. They, too, had high expectations of their side, which was one controversial handball call away from reaching the semifinals in the 2010 Cup. "I'm sorry, my friend, but you are going to lose 2-1 again", a group of Ghanaians told me after we chatted and took a picture together. As the lineups were announced, the atmosphere in the stadium grew electric. Pre-game: American fans hammed it up for the camera in historical costume. One of my favorite parts of international soccer is the national anthems. I'm already used to getting chills every time I sing our own anthem, but as we belted out the Star-Spangled Banner I felt this one was special. I had never sang the national anthem at a national team event, and it was something to behold. As all of us in red, white, and blue sang together, I got a little choked up thinking of the thousands in the stands who had made the trek from far and wide to be here. I also was thinking of my family and friends back in the US, all over the world, and those deployed serving our country. They, too, would be belting out the anthem at all hours of the day. True to our team's slogan, we really were "One Nation, One Team". We couldn't have dreamed of a better opening. Thirty seconds in, US forward Clint Dempsey strode into the penalty area and dispatched the ball past the Ghanian keeper for a shock 1-0 lead (the fifth fastest goal in World Cup history). We hadn't even settled into our seats and we were already going crazy. Well, everything went sour soon after that, as the injuries began. Key striker Jozy Altidore left with a hamstring injury after 20 minutes. Dempsey took a boot to the face, breaking his nose. Matt Besler also pulled up and had to be removed at halftime. Meanwhile, Ghana slowly began to step up, laying siege to our goal with relentless attacks. All along, the din from our stands never subsided; chants of "U-S-A! U-S-A! U-S-A!" and "I BELIEVE THAT WE WILL WIN" rang through the stadium. But the Ghanaian fans continued to sing too, and even gained support from the Brazillian fans in attendance and the Mexican fans still remaining in Natal after their opening match against Cameroon. Editor's note: If this is how excited Ghanaian fans get while waiting in line outside the men's room, just imagine them during the match. Thanks to stellar goalkeeping from Tim Howard and exceptional rear-guard performances from Geoff Cameron, Jermanine Jones, and Kyle Beckerman, as the clock waned we still clung by a thread to our 1-0 lead. Come on boys, hang on for 10 more minutes, I thought. But in the 82nd minute, Ghana captain Asamoah Gyan and Andre Ayew played a perfect one-two in the box that Ayew coolly finished with the outside of his left foot. It was no less than Ghana deserved. Graham Zusi to John Brooks. Goal! As amazing as the goal was, the job wasn't finished. The last 10 minutes of regular and stoppage time felt like 10 years as the team desperately looked for a way to see out the match. An equalizer from Ghana would have been too cruel. At last, the final whistle blew. We continued our celebrations, hugging one another and screaming "U-S-A" as we poured into the streets. 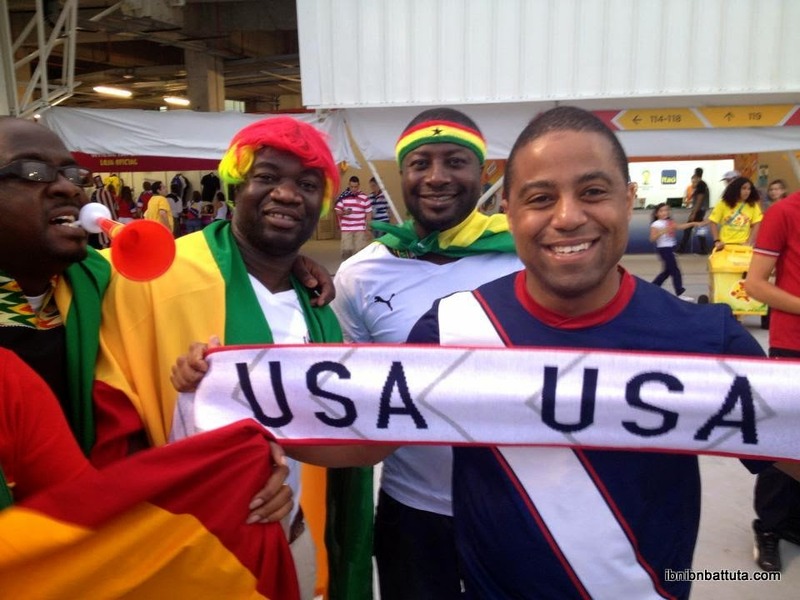 The Ghanian fans, who had put on a great show during the match, were still in a celebratory mood, taking photos with Americans and partying and dancing in the streets as if they had won. They also acknowledged their defeat with class: "Your spirit drove you to victory", one Ghanaian fan told me as we left the stadium. Another group I spoke to lamented our victory: "We had 18 shots on goal and dominated the game. You did see that, correct?" "Yes, but the final score was 2-1, my friend!" He laughed and replied, "You know what? That's football." Our 2-1 victory over Ghana in the bag, now it's on to the Amazon, where Ronaldo and Portugal await! USA! 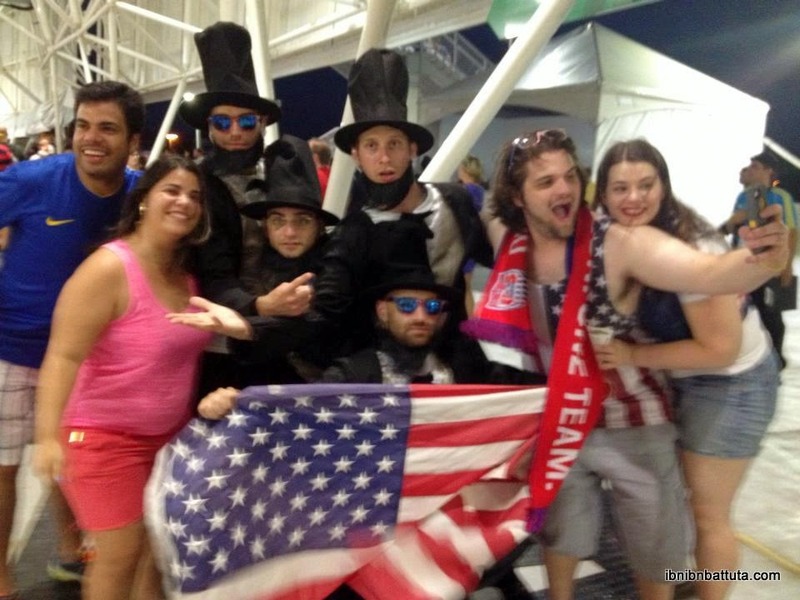 Stay classy, America: some of the festive fans Gavin met before the match.